The suspects were arrested on Wednesday morning when RRS Intelligence Team stumbled on a lead that one of the suspects was lurking in a gaming shop at 29, Awoseni Streets, Shomolu. On interrogation, the suspect, who turned out to be a buyer of one of the stolen mini-laptops specifically designed for secondary school pupils, led to the arrest of the principal suspect and 13 others. "I knew he was a wayward guy. I accommodated him because his relatives whom he was staying with were relocating from Shomolu. I offered to assist him since I had an apartment to myself.... He was my junior in secondary school. He was one of my fans while I was competing for the school and Local Governments in the state.... Immediately he joined me, a lot of things started missing in the compound. Neighbours were losing their phones. Later, we discovered that he was the one stealing all the phones. My parents directed me that I tell him to move out and I did." 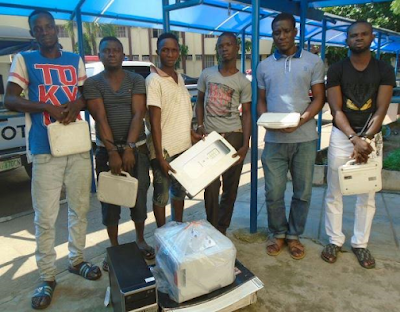 Adesola also stated that, before this time, he had brought 7 mini-computers, 1 scanner, 1 desktop, a Laser Jet printer for keep in my room. Although, I saw the name of the school on those items, since he was always visiting that school, I didn’t know they were stolen items.... After a long while I didn’t see him, I attempted to sell all these items. Some I have sold, and others like desktop, printer and four mini-laptops, I have not sold. I gave them out to friends and people that I know can help me sell them. Arrested along with the suspect were Lukman Sokoya, 34; Wasiu Adejare, 30; Ismaila Adebowale, 42; Ahmed Olaleye, 17 and Ramon Mukaila. According to investigators, only six out of the 15 suspects arrested were directly connected to the burgled school and stolen computers as well as its accessories. Four of the suspects were released to their relatives, while the remaining five suspects were held for their link to cult activities in Shomolu. 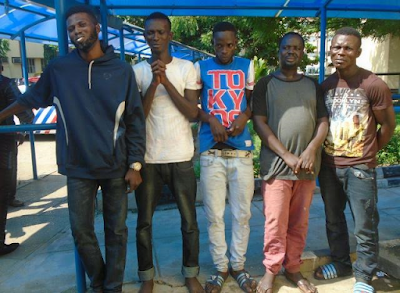 The suspects, Kazeem Adenuga, 24; Owolabi Yusuph, 35; Wasiu Shodipe, 27; Samson Kareem, 34 and Sheriff Badru, 22, were arrested when investigators discovered that they were involved in ceaseless violence in Awoseni Street on Tuesday night. The eleven suspects have all been transferred to SCID for further investigations. Confirming the incident, the Police Public Relations Officer, SP Dolapo Badmos, stated that the Command was leaving no stone unturn towards reducing crime in the state and make it safe for investment.